The San Francisco Zoo is a vibrant and interesting zoo. I've been to the San Francisco Zoo twice in the past several years. 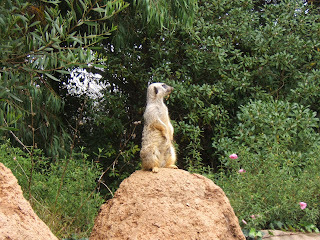 It has also inspired me to visit my local zoo, which I had not done for many years. The San Francisco Zoo is not only the largest zoo in northern California, it is also the oldest. There are many exhibits that have recently been renovated or added, so there is always something new to see at the zoo. The main entrance and parking for the zoo is located off either Sloat Boulevard or the Great Highway (bordering the Pacific Ocean). The main parking lot fills up fairly quickly, so you may need to park on the nearby streets; Sloat Blvd. has a lot of center and side parking. You can bring a picnic to the zoo or pick-up some pretty decent selections at one of their eateries (yeah! vegetarian selections.) As with any venue like this, prices tend to be a little high, so if you're on a budget I would bring your own food or eat before or after your visit. One of the exciting new areas completed in the last few years is the giraffe barn. You can watch the giraffes get fed daily at 4:00, which is something I definitely recommend seeing. The giraffe feeding is very entertaining, but just watch giraffes move is very entertaining, as they are such odd looking, graceful creatures. The zoo also has other scheduled feedings. One of my visits to the zoo was during Halloween, so I got some bonus feedings as the animals were given pumpkins to eat. It was hilarious watching the lemurs eat their Halloween treat; the penguins, on the other hand, really didn't care. Of course, no trip to a zoo, nature center, or aquarium would be complete without seeing an otter of some sort. 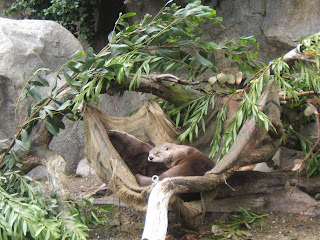 Otters, my favorite non-domesticated animal, live at the SF Zoo in the form of river otters. Otters in general seem to be either playing or sleeping...as seen in the picture of above, sleeping was the activity of choice the day I was at the zoo. Springtime at the zoo is always an excellent time to go, as it is the season of baby animals. The zoo recently announced the birth of a new giraffe calf, which will be seen in the upcoming "Baby Bonanza" event in May.